Today is the first step in our experiment with Straw Bale Gardening. A little history… Last year was our first attempt at gardening on the property as a family. It was our second year on the land. We weren’t sure what to expect out of the soil… but, as many who have gone before us have said, ‘you learn as you go.’ This was the case as we put our seeds into the ground. Our harvest was nothing to brag about… but it was fun to watch the kids snack on all of the peas that never made it to the kitchen. We were also making mental notes of things we need to do better next season. A location with better sunlight. Do more to prepare the soil in advance. We live in a relatively secluded area that covers 10 acres. The bulk of the available land is towards the back of the acreage. It is in the back of the property where there is ample open space with direct sunlight. However, we are limited in controlling the irrigation back there. Therefore, it is important to us to have the garden closer to the house where we can run the hose out to the garden to keep everything well hydrated. Which… is where we run into a few limitations for better sunlight. Our home is located among many trees. This is great for shade during the hotter months of summer. But not good for a healthy garden. As winter faded this year, and the spring sun began to melt away the snow… we paid close attention to where the white stuff was melting away first. There is an area behind the house that gets a good amount of sunlight, and we have picked our location. There is one slight issue with this spot: the ground is not very level. It’s not a steep incline either… it is just not what one would think of when picturing a garden layout. Not a huge issue… other than the physical demands of tending to a garden, while on a slope. It does lend itself to another small concern in our plans for this years garden: We are going for straw bales. Our concerns about the growing ability of our soil had us researching during the winter months for ways to boost the health of what we have. It was in this search that we stumbled on Straw Bale Gardening. Beyond just seeming like a cool way to do it… straw bale gardening has some functional benefits as well. Might not seem like a big idea for the young and strong… but, we are beginning to feel aches and pains in our bones with all of the bending over. It’ll be nice to have the work lifted up a bit. Straw bales are also tall enough to discourage some of the insects that would need to make their way up the height of the bale to our tender plants. We are hoping this cuts down on unwanted guests. However, being that we are going to have large blocks of straw… that are moist an in a state of decomposition… coupled with the weight of the vegetation that is growing… remember, we are on a slight slope. Thought has had to go into not allowing gravity to have its way in pull apart our bales. We will use poles and boards to support the bales effort to stay strong against gravity and a slight (less than) 20 degree angle. We aren’t too worried about it. Our shopping for straw bales began about a month ago. Not wanting to spend a ton of money on them, we shopped and networked around. Our price per bale went from $10… to $5… to $3.50… and finally to $3. Never hurts to ask. 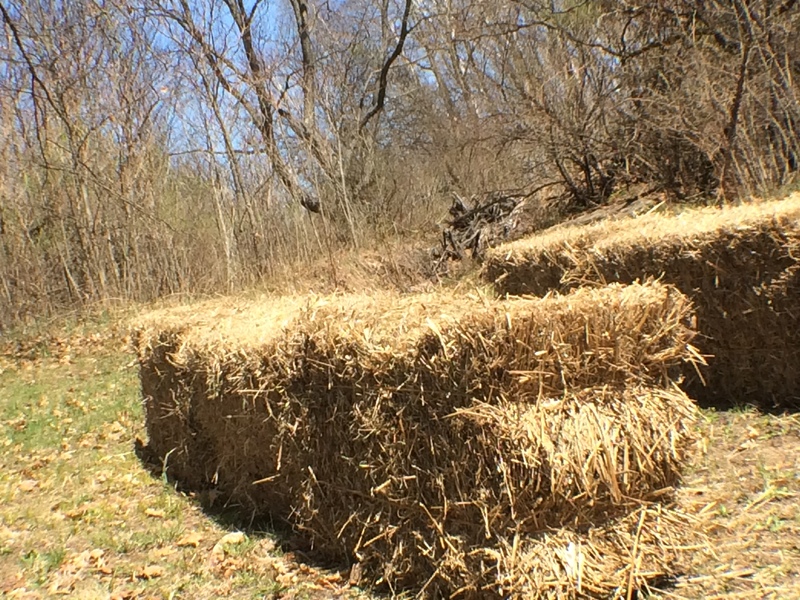 If all goes well… the bales should last two seasons. Let’s see what happens.